Honoring our traditions. Building our future. 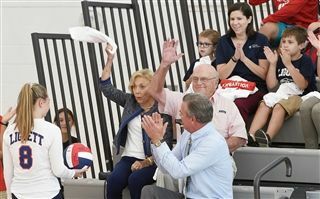 members of the University Liggett School community filled the bleachers at the Boll Campus Center to celebrate Opening Knight -- the first home game in the new Fruehauf Gymnasium. Before the girls' varsity volleyball team took the court, John and Marlene Boll and Richard and Janet Fruehauf were recognized and seniors Alyssa Hamilton and Mary Weiermiller presented volleyballs signed by the team to each couple. See photos from the game.